First off, here is the entire tournament bracket! This was a very tight series until the end. The 6th-seeded ’78-’79 Canadiens needed a double overtime winner from Pierre Mondou, which completed his hat trick, to take Game 1 by a score of 3-2. Meanwhile, goaltender Ken Dryden stopped 38 of 40 shots against for the ’78-’79 Canadiens. Then, Jacques Lemaire scored just 24 seconds into Game 2 to give the ’78-’79 Canadiens a very early 1-0 lead. However, the 5th-seeded ’72-’73 Canadiens scored three times over the course of the rest of the opening period to take a 3-1 lead. That would end up being the final as the ’72-’73 Canadiens tied the series at one while doubling the ’78-’79 Canadiens in shots, 40-20. In Game 3, the ’72-’73 Canadiens tied it 2-2 late in the second thanks to two quick goals form Lemaire. However, defenseman Larry Robinson reinstated the ’78-’79 Canadiens’ lead relatively late in the third and then fellow defenseman Serge Savard assured victory with an empty netter with just 10 seconds left. Game 4 was tied 3-3 after two periods, but Yvan Cournoyer scored just 18 seconds into the third to give the ’72-’73 Canadiens a 4-3 lead. However, just three and a half minutes later, Mondou re-tied the game for the ’78-’79 Canadiens. However, just about a minute and a half later, Doug Risebrough gave the ’78-’79 Canadiens their first lead of the game, 5-4. Exactly nine minutes later, Chuck Lefley tied the game for the ’72-’73 Canadiens. Then, with a little more than a minute left in regulation, Yvon Lambert scored his second goal of the game to give the ’78-’79 Habs a late 6-5 win to give them a 3-1 series lead. The ’78-’79 Canadiens then dominated their way to a 6-1 win in Game 5 to clinch a spot in the Ultimate NHL Playoff for the first time. Robinson led the way with three assists in the win while both Bob Gainey and Steve Shutt tickled the twine twice. 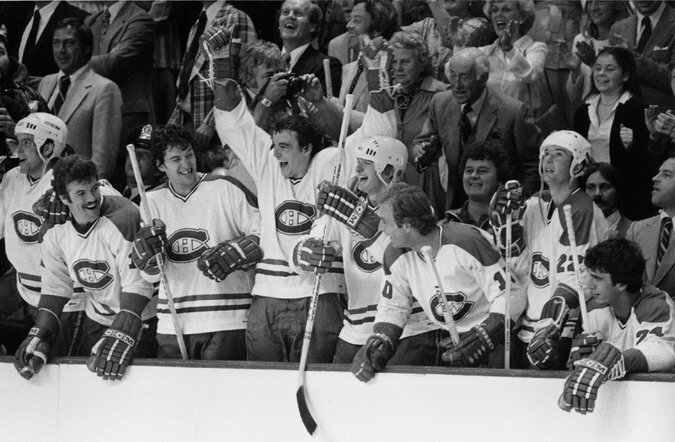 The ’78-’79 Montreal Canadiens are the 48th and final team to qualify for the upcoming 2015 Ultimate NHL Playoff. It will be their first trip to the tournament and they are the 25th team that will make their UNP debut. Up next is…..THE 2015 ULTIMATE NHL PLAYOFF!!! This entry was posted in Qualifying Tournament, Ultimate NHL Playoff and tagged Bob Gainey, Chuck Lefley, Doug Risebrough, Guy Lafleur, Jacques Lemaire, Ken Dryden, Larry Robinson, Montreal Canadiens, Pete Mahovlich, Pierre Mondou, Qualifying Tournament, Serge Savard, Steve Shutt, Ultimate NHL Playoff, Yvan Cournoyer, Yvon Lambert. Bookmark the permalink.